Use for every lightening salon service from highlights, ombre or full head colour change (use on or off the scalp). Blondly does not dry out while are working and is easy to wash out of the hair; helpful in a busy salon! Argan Oil Also known as “desert gold”, obtained from pressing the fruit of the Argan plant, which grows in southwest Morocco. Rich in essential fatty acids, Omega 9 and sterols its extraordinary nourishing and restorative. Jojoba Oil Rich in natural antioxidants, it contains vitamin E and minerals that protect and hydrate the hair ﬁbre without hindering the action of the technical service, for truly impeccable results. An exclusive micro-granular, dust-free decolourising powder that offers the speed and lift of a powdered lightener with the conditioning and protective benefits of a cream. 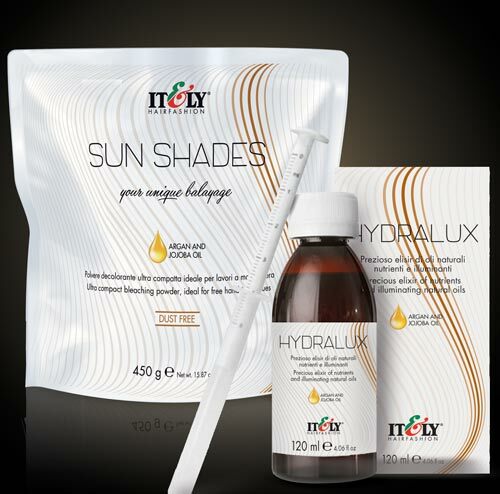 Ideal for on or off the scalp decolourising services and colour removal. Easy to mix, it doesn’t swell and remains compact during the whole application. It is recommended for decolourising up 6 levels. Blondly bleaching cream lightens hair up to 7 shades. Mix with Oxily developer to quickly create a fuss free silky formula that adheres perfectly to the hair for uniform results. Use for every lightening salon service from highlights, ombre or full head colour change (use on or off the scalp). 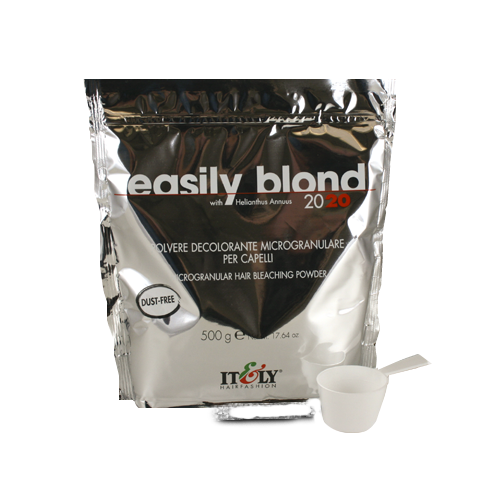 Blondly does not dry out while are working and is easy to wash out of the hair; helpful in a busy salon. Micro-granular bleaching powder with an exclusive, dust-free formula which offers the speed and lift of a powdered lightener with the conditioning and protective benefits of a cream. Ideal for on or off the scalp decolourising services and colour removal. Easy to mix, it doesn’t swell and remains compact during the whole application. It is recommended for decolourising up 6 levels. Argan Oil Also known as “desert gold”, obtained from pressing the fruit of the Argan plant, which grows in south-west Morocco. Rich in essential fatty acids, Omega 9 and sterols it’s extraordinary nourishing and restorative. Micro-granular bleaching powder that offers the speed and lift of a powdered lightener with the conditioning and protective benefits of a cream. Ideal for on or off the scalp decolourising services and colour removal. Easy to mix, it doesn’t swell and remains compact during the whole application. It is recommended for decolourising up 6 levels.